Home›Featured›Tech Insights: Should I Use a Server or the Cloud? Success in today’s business landscape is tied to your ability to utilize technology to boost productivity, efficiency, and profit. Unfortunately, selecting (and even understanding!) modern technology can be difficult, given the rapid pace of development. 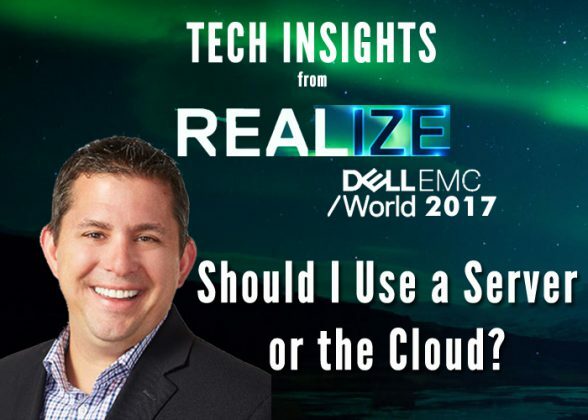 That’s why I created this Dell EMC World video series: to demystify the latest technology and let you know that help is available to those who are trying to select the right technology for their growing business. So far I have spoken with Erik Day, Elizabeth Gore, and Bert Park. Today I talk again with Erik Day, the Vice President and General Manager of Small Business Sales in North America at Dell. We discuss a big announcement from Dell and one of your burning questions: should I use a server or the cloud? At the event, Dell announced their new line of 14G servers. As Erik tells me, 14G stands for 14th generation, and the announcement is a big deal because Dell only launches new servers ever 2-3 years. The 14G server incorporates the latest Intel technology and is able to scale with the size of your business as you grow from a single entrepreneur to a company with employees. The more people you add to your organization, the more likely you are to outgrow PCs and need a server for quicker and safer data processing, sharing, and storage. The 14G is designed to grow as you grow. #DellEMCWorld2017 interview: @Erik_M_Day shares his insight on using a #server or the #cloud. With all the talk about the cloud these days, you first might wonder if you need a server at all. I posed that question to Erik, and he says it depends on your comfort level and needs. Server Solution: Some existing business owners have prior experience with servers and do not yet feel comfortable using the cloud. For them, the 14G is a perfect option. Cloud Solution: Other business owners, especially millennial entrepreneurs, already do everything on the cloud as it is. When they want to expand their business, they can set up a cloud-based system. Hybrid Solution: There are also business owners who feel comfortable with servers but are interested in trying the cloud. They can use a hybrid solution where they have a local server and also explore the benefits of the cloud. In summary, the cloud works. Servers work. And Dell makes sure they are both safe and effective. When you speak with the sales team at 1-877-BUYDELL, they will ask questions to understand your needs and make sure that your needs are at the center of the solutions that are offered. “Technology doesn’t have to be scary!” says Erik, and I wholeheartedly agree. Check out the video above to hear more about the cloud, servers, and working with Dell, plus stay tuned because there are still more Dell EMC World videos to come!